What makes chicken casual?? When you can cook and serve in the same dish and even the salad tastes good right along side the chicken on the same plate. Sometimes I just want to curl up with a comfort food dinner and watch an old movie. Olive Oil, Rosemary, Oregano, Flour for dredging. There is some prep work to be done. 1)	Boil a small pot of salted water and par boil your cut potatoes, about 4-5 minutes. 2)	Dredge the chicken bits in flour and lightly sauté them in a pan. I know. I know. I just gave you 2 pots to clean. Get over it; it’s worth it. 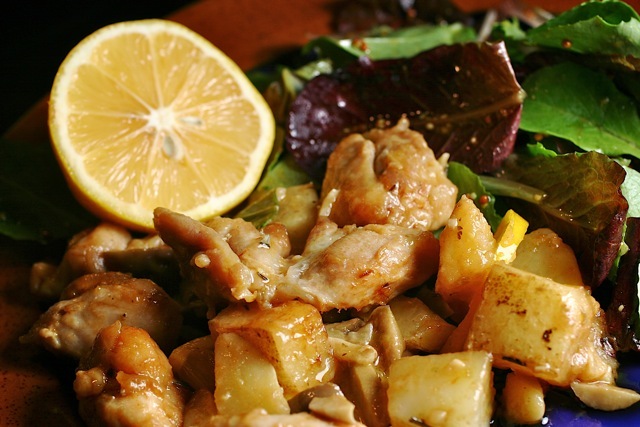 In an ovenproof dish, like a clay pot, combine the drained potatoes and chicken. Add the veal stock or red wine, a sprinkle of salt and some rosemary and oregano. I think people forgotten the value of oregano, but that’s another post for another day. Prepare a green salad with a mustardy vinaigrette dressing and leave it in the fridge. Place the dish in a warm oven (325F/165C) and roast until the chicken is almost done, about 30 minutes. It depends on how big you cut your chunks of chicken or if you used breast or thigh meat so 30 minutes is just a guideline, ok? Thighs take a little longer. When it looks all brown and glazed, its pretty much done. If you don’t have sufficient brownage, you can crank the heat on the oven for the last 5 minutes. Go watch the movie while it’s cooking. When you are starving and the plot isn’t so enthralling, and you are ready to eat, remove the chicken from the oven and toss in the olives and some thick slices of lemon. Mix thoroughly and return to the oven. By adding the olives and lemon at the end, their flavors will stay unique and separate instead of just blending in. You don’t actually eat the lemon pieces, unless you want to, but it’s amazing how quickly that bit of lemon will release flavor as soon as it hits the heat of the dish. Place the mustard vinaigrette dressed salad on one side of the dinner plate. Check the action on the movie or have your spouse yell if anything of interest happens. Plate the chicken on the other side of the plate, pour a glass of wine and enjoy your dinner and the movie. On a frosty January night it doesn’t get more comforting than this.